Today, May 5, marks the 69th anniversary of the Victory in Europe during World War II, known as V.E. Day. A national holiday in every major Western European nation, V.E. Day is celebrated particularly boisterously in France as the country suffered a long occupation by the Nazis and even the establishment of a collaborationist government in the southern half of the nation. In Paris, locals and visitors alike can find several historical sights and monuments related to World War II and the Nazi occupation, particularly locations that are directly linked with the mass arrest and deportation of French Jews in the city. Straddling the eastern tip of Ile de la Cite just behind Notre Dame is the Memorial de la Deportation, a tribute to the more than 200,000 French men, women and children—including homosexuals—who died in Nazi extermination camps during World War II. The free memorial is located on the actual site where many Parisians were processed and loaded onto ships for transportation to camps in Eastern Europe. For most, it was their final journey: Only 3% of French citizens sent to the death camps survived. According to historians, of the 200,000 French men, women and children sent to concentration camps, 85,000 were French resistance fighters and 76,000 were Jews (including 11,000 Jewish children). Hours: Daily 10 a.m.-noon and 2-7 p.m. Hours: Daily, 9 a.m.-8 p.m. The Musee de l’Armee, a museum dedicated to the French military includes a large section devoted to World War II, the Nazi occupation of France and the French resistance to the German forces. Located in the Les Invalides complex on the Right Bank, the museum displays most World War II pieces in large permanent exhibit called the “Contemporary Department: The Two World Wars, 1871-1945.” The exhibit includes French and Nazi uniforms, weapons and artillery, Nazi propaganda pieces, audio recordings, Nazi flags and signage, and many personal items from French soldiers, members of the Resistance, Parisian citizens living under Nazi occupation and even some German military officials. A separate exhibit is dedicated to Charles de Gaulle, the French soldier who led the Resistance and became president of the nation following World War II. Hours: Daily, 10 a.m.-6 p.m. 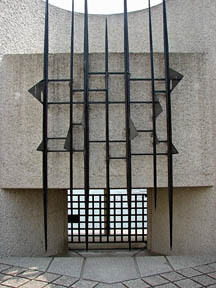 The Memorial de la Shoah is a museum specifically focusing on the history of Jews throughout Europe during World War II. Designed to educate Parisians—and tourists—about the Holocaust, the free museum was opened in the Marais district of the city in 2005. The museum itself includes The Wall of Names, a stone memorial with the engraved names of Jewish victims of the Nazis; The Wall of the Righteous, a tribute to 2,693 French citizens honored for their efforts to oppose the Nazi extermination of European Jews; the Crypt, which is a symbolic tomb for the 6 million Jews who were not afforded a proper burial after being murdered by the Nazis (it includes ashes collected from several Nazi extermination camps); and the Amplified Passage, an audio exhibit that memorializes the deportation and murder of Jewish children. In addition to the museum, the site houses the Center of Contemporary Jewish Documentation, which was founded in the 1940s as a historical archive of the Jewish experience under the Nazis. The center includes the ability to search for the names of specific European residents who lived (and, sadly, most of whom died) during the war. These two museums explain and document the history of the French Resistance to the Nazi occupation of France during World War II and of the Liberation of Paris by the Allied Forces in August 1944. The facilities focus on the roles of two leading French citizens during the period— Jacques-Philippe Francois Marie Comte de Hauteclocque and Jean Moulin. Leclerc was a French general who led major military operations in Africa, particularly in French Equatorial Africa, the French Congo, Chad, Gabon, Tunisia and Libya. Leclerc was then moved to the European theater in 1944, where he participated in the liberation of France and personally led Allied troops into Paris in August 1944. Leclerc later led French troops into Germany in the final European battles of World War II. Moulin was a high-profile member of the French Resistance who played a critical role in organizing Resistance activities throughout France by helping to form the Mouvements Unis de la Resistance, the first coordinated group of Resistance units that operated jointly throughout France. He was arrested by the Nazis when attending a meeting of Resistance leaders near Lyon, France, and later died after being tortured by the Gestapo (some historians say he committed suicide after weeks of being tortured, while others believe the allegation of suicide was meant to cover up for the fact that Klaus Barbie, head of the Gestapo in Lyon, beat Moulin to death). Hours: Tuesday-Saturday, 8 a.m.-6 p.m. Sunday, 10 a.m.-8 p.m. Closed Monday. 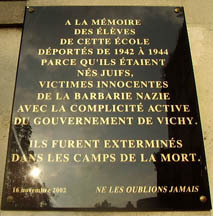 Scattered throughout Paris, but with a concentration in the Marais district that is the heart of the city’s Jewish community, are plaques on school buildings that indicate the arrest and deportation of Jewish students by Nazi forces during the Nazi occupation of France. In almost every case, the Nazis invaded the school buildings and rounded up the Jewish students in full view of their teachers and classmates. Most were then sent to extermination camps. If you’re touring the Marais, be sure to check out the facades of any schools you stumble across—many include the monuments to the slain Jewish students. This entry was posted in Famous Paris destinations, History of Paris, Museums, Parks and Squares and tagged Anne Frank garden, Deportation Memorial, Holocaust, Memorial de Shoah, Memorial of General LeClerc and of the Liberation of Paris-Musee Jean Moulin, Musee de l'Armee, Nazi occupation of Paris, V.E. Day, World War II by Bob Adams. Bookmark the permalink.